In this painting, the divine couple, Radha and Krishna, clad in lotus petals, sit amidst a lush grove, by the edge of a lotus-filled pond. The pair appears to be exchanging lotus blossoms as they gaze adoringly at each other. The dark-skinned Krishna holds a bouquet of three flowers in his right hand and a single stem in his left. Radha, with folded hands, clutches the long stalk of another delicate blossom. Sprigs of buds spring jauntily from their lotus headdresses. Adding to the profusion of petals, lotuses in full bloom form the seat on which each figure sits. While such paintings on the one hand express a tender earthly love, on the other they reference profound religious ideas. The paintings reflect the mystical doctrine of ‘bhakti’, which dictates that devotees may seek unity with god through ardent devotion and unquestioning faith. The intense passion that Radha feels for Krishna and her consuming love for him, therefore, serve as metaphors for deep spiritual yearning and a devotee’s desire for union with the divine. 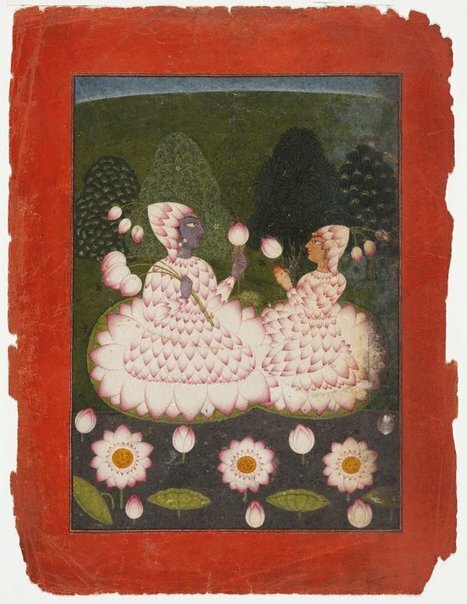 The theme of Radha and Krishna clad in lotus petals also alludes to the practice of ‘phulasiya’, or flower-dressing, wherein venerated images are lovingly dressed and decorated. The painting was produced in the region of what is today Jammu and Himachal Pradesh in north India. Nestled among the snow-capped peaks and fertile gorges of the Himalayan foothills, this region – often referred to as the Punjab Hills, a name by which it was known prior to Indian independence – developed an artistic convention that paralleled in vision, creativity and excellence the Imperial Mughal school as well as those of the contemporaneous Rajput principalities to Rajasthan. The Punjab Hills region comprised a number small feudal states, each with a ruling Rajput court and its distinctive style of painting. This painting betrays features of the art of the state of Mankot. The heavily-outlined, elongated eyes of the figures, as well as their somewhat fleshy chins are characteristic of the early 18th century Mankot style. As is common with paintings from the Punjab Hills, the artist revels in the depiction of nature, particularly the leafy trees that form a verdant backdrop for the couple. Chaya Chandrasekhar, 'Love amongst the lotuses: Radha and Krishna Find Bliss in the AGNSW Collection' in 'Look', August 2007, pg.15. Art Gallery of New South Wales annual report 2007 , Sydney, 2007, 7 (colour illus.). Chaya Chandrasekhar, Look , 'Love amongst the lotuses', pg. 15, Sydney, Aug 2007, 15 (colour illus.). Jackie Menzies, Look , 'Love in India', pgs 12-13., Sydney, Oct 2014, 12. Carolyn Murphy and Analiese Treacy, Contributions to the 5th AICCM book, paper and photographic materials symposium , 'Indian miniature paintings and their margins', Canberra, 2008, 145 (colour illus.). Justin Paton, Look , 'Conversations. A new way to engage with the Gallery's Asian art', pg 22-23, Sydney, Oct 2014, 22-23 (colour illus.). Yvonne Tan, Asian Art Newspaper , 'Intimate Encounters, Indian Paintings from Australian Collections', London, Apr 2008, 13 (illus).